Social media forms an important part of every professional and amateur photographer's online success. In addition to a website, having good social media presence helps with getting clients and networking with like-minded passionate people. When it comes to digital photography, Facebook and Instagram lead the way due to the huge number of active users. Instagram is so easy to use and totally centered around the concept of sharing stunning mobile images. The huge success of this app has attracted even non-photo related businesses too. But what about the photo size and resolution requirements so that our huge sized DSLR photos don't lose quality? We will focus on Adobe Lightroom Classic CC image export settings for both Instagram and Facebook in this post. 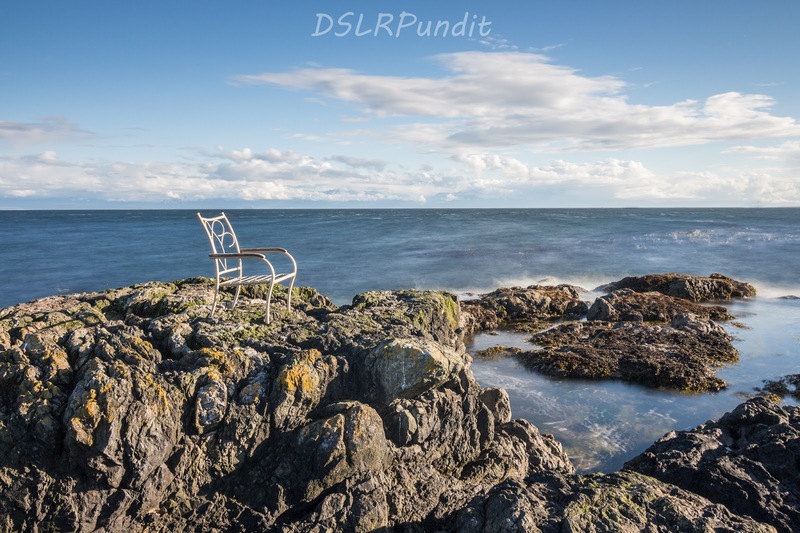 Uploading a full resolution DSLR camera image to Instagram or Facebook is an easy way to trigger the complex resize-compression algorithms and ruin image quality. Both Instagram and Facebook use compression algorithm on images to save the amount of server space needed to store uploaded images. Also, it makes the browsing experience faster for users. For photographers, this often creates a lot of issues as the image starts to look grainy, pixelated or poor in quality. In the next section, I will mention the best Lightroom image export setting for Instagram and Facebook. 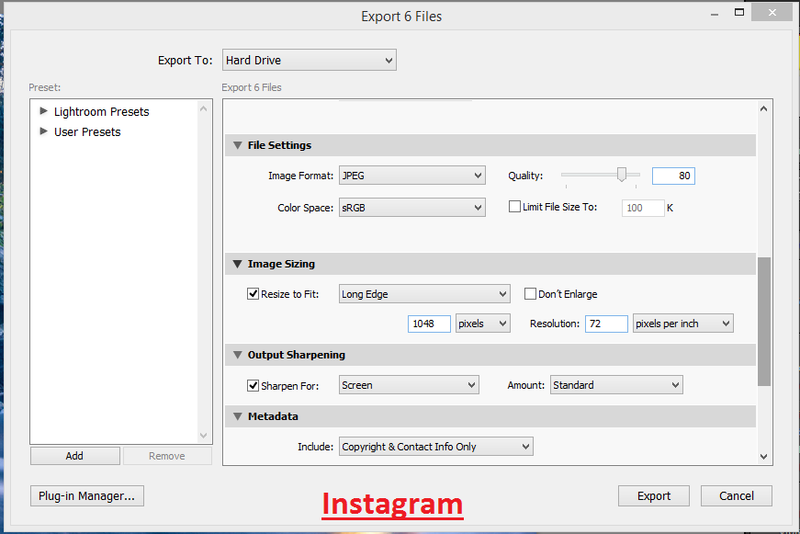 This way you won't have to rely on Instagram or Facebook to resize, crop or compress your image in any way. Colour space: If the image will be used for portfolio website and social media purposes, always keep it sRGB. Unless you are printing your images at a colour lab or photography store, never use Adobe RGB. PPI/DPI: In digital, all that matters is the pixel dimensions of the exported image file. Pixels per inch or Pixels per cm value matter for printing only. PPI will not change your file size (MB) either, so don't worry at all about this setting for digital usage. Make sure high quality is checked when uploading to FB. Resize to Fit: Long edge 2048 pixels. Resolution: Does not matter, that's for printing. Amount: Low or Standard. I usually go with Standard, increases the file size a bit compared to low. 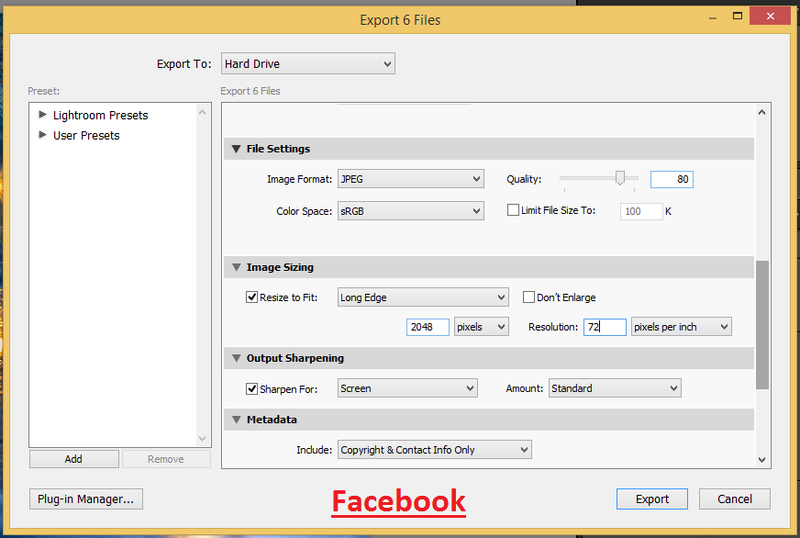 Facebook wants the file size to be less than 100 KB as mentioned in one of the help articles. 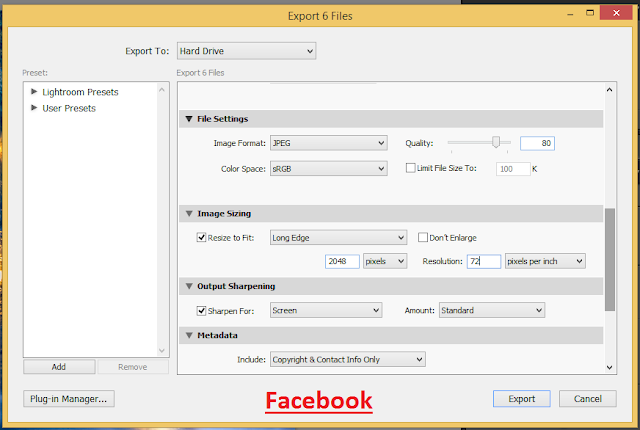 Below is a screenshot of my Lightroom image export settings for Facebook uploads. As per the 2018 support documentation, the maximum image width allowed by Instagram is 1080 pixels. For an image with a width between 320 and 1080p pixels, height should be kept between 566 and 1350 pixels respectively. The reason is to maintain the aspect ratio as specified by Instagram. The aspect ratio value should be between 1.91:1 and 4:5. If it is not, Instagram will perform its own cropping and fixing on the image which will impact quality. For portrait images: Short edge 1080 pixels. Resolution: Does not matter, this setting comes into play when printing images. Amount: Low or Standard. Below is a screenshot summary of my Lightroom export setting for Instagram uploads.